No single consumer electronics product category has been hurt more by poorly planned and executed HDMI upgrades over the past decade than AV preamps. While large Asian receiver companies can hope to keep up with HDMI version-"God-knows-what's-next" updates because of large engineering budgets and high sales volume, smaller audiophile companies that cautiously dipped their toes in AV preamp waters in most cases got a smack-down for their efforts. It's hard, if not impossible, to keep up with the feature sets of a modern HDMI receiver while trying to provide audiophile-grade sound. • Read more AV preamp reviews from HomeTheaterReveiw.com's staff. • Explore more reviews in our Amplifier Review section. • See pairing options in our HDTV Review section. Krell survived the rough times, mainly because the company moved up-market. The cost to do AV preamps right was quite high: the Evolution 707 AV preamp is over $30,000 and the Krell S-1200u is over $10,000. Krell isn't the only trusted high-end company to go up-market, either. Classe and Meridian products are priced up there, while players like Mark Levinson are simply out of the market, at least for now. 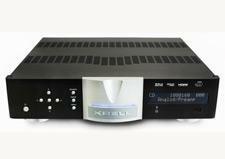 But now, under new leadership and armed with some private equity money, Krell has made a bold statement in the AV preamp market with its latest offering. At $6,500, the Krell Foundation preamp represents the first true high-end HDMI AV preamp designed to meet the needs of the audiophile while staying well under the $10,000 price point since, say, the Sunfire Theater Grand products or Meridian G-Series AV preamps of the recent past. 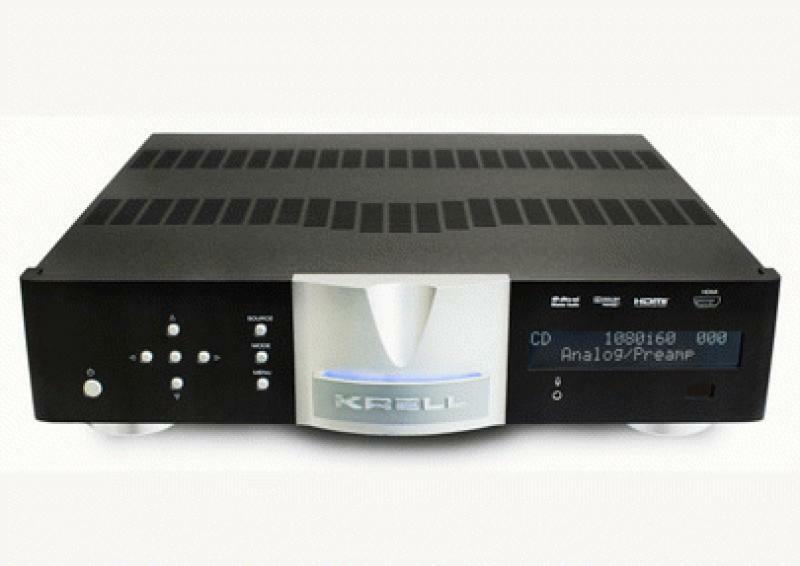 Krell first showed the Foundation preamp at the 2013 Consumer Electronics Show to much fanfare and excitement. HomeTheaterReview.com wasn't the only publication to gush over the unit, but we were first to get our greedy hands on a review sample. The Foundation was shown with a matching high-end media server called the Connect, which is currently shipping. It's roughly described as a Roku on steroids with an audiophile bent, which is meaningful to the Foundation, as the Connect afforded Krell the ability to keep things more simple in the preamp - which is a refreshing design philosophy in this category. 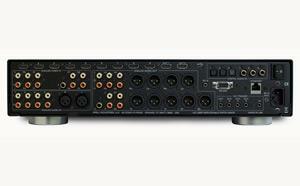 The Foundation boasts...get this...10 HDMI 1.4a inputs. People, that's a lot. How many sources do you have that use HDMI? Perhaps more than four, but 10 covers you for pretty much every conceivable source component that you could possibly own today. Let's say you are rocking a complex, modern system that includes a Blu-ray player, an Xbox and a PS3, a cable or satellite DVR, an Apple TV, and a Roku, but you also want room to add, for example, a RedRay player, the new Kalidescape server, and one of Sony's new Ultra HD servers. With 10 HDMI inputs, the Foundation has you covered. How about HDMI outputs? Krell thankfully packs two of them, which both include ARC (audio return channel) to give you full access to the source-like features of your HDTV, such as Netflix, CinemaNow, and so on. The Foundation also includes other legacy inputs, such as composite video (3) and component video (2). Analog audio outputs include a full array of both balanced (XLR) and unbalanced (RCA) outputs; thus, no matter what amps you plan to connect the Foundation preamp to, you are set. The look and feel of the Foundation follow a simpler path than more expensive products from Krell's past. The aesthetic is unquestionably Krell, but the unit now comes in one finish - not a choice of silver or black facades. This is one of the key ways that the new Krell can keep costs down; it doesn't have to stock both colors. The company also "pulled a Vizio" by skipping me-too features like an internal video processor. Your HDTV or projector likely has a killer video processor. I know every top HDMI receiver has one built in that can "scale to 4K" but, respectfully, you don't need to be doing such up-conversion in your AV preamp. Instead, the Foundation passes the signal through bit for bit without any processing. Krell focused on what was important: lots of inputs and outputs. expensive power supplies, top-notch internal parts and so on. The remote control is sadly an audiophile throwback. Its brick-like industrial design is pretty lacking. While you could defend your home with the chunk of metal, it doesn't feel very good in your hand. Amazingly at this price, the remote control is not backlit. I think Krell may have gone to the parts bin on this one, assuming that you, the enthusiast, would use something aftermarket - be it an entry-level Harmony or a high-end Crestron system. Either of these options is better than what ships with the Krell so, if you are considering taking the plunge, make sure you have some money reserved for system control. Personally, I am a Crestron man, but that rock-solid solution is about as expensive as it gets. The Foundation does have various control options, including RS-232. Keeping in tune with the higher-end custom installation side of the market, the Krell rack-mount kit ($150) is refreshingly well-designed and perfect for those of us who have a fetish for a nicely designed Middle Atlantic-type rack. The Krell kit fits fantastically into a 19-inch-wide space and looks quite at home, just like my former reference AV preamp, the Classe SSP-800, did in a nicely designed rack. Installing the Foundation's rack kit requires that you remove the wraparound cover plate, which slides off the back, and replace it with one that has four screw holes to easily attach the preamp to your rack rails. The design goal was to keep the number of screws that you see to an absolute minimum of two. A small note in terms of rack-mounting the Foundation: you obviously want to give the preamp some space to breathe above and below. Also, if you want to remove the preamp, you need to take the empty rack blank panels out in order to remove the Foundation from the rack, as there is a bolt protruding a little from the bottom of the unit. For those of you not rack-mounting your Foundation, this is a non-issue. The front faceplate is very well thought-out, especially when you consider that it is only two rack spaces tall. An LED readout sits to the right, and navigation for the menus and inputs sits to the left, as does one very welcome HDMI input on the front. The back layout is busy but not too crazy, considering its 11 HDMI ports (nine in and two out), component video, composite video, balanced and unbalanced outs, and more. The overall two-rack-space height of the Foundation is slim in comparison to today's top AV preamps and higher-end HDMI-based receivers. The unit runs pretty cool, and the pairing of the Foundation with a Krell S-1500 amplifier looks really nice. Setup of the Foundation can be done directly via the device or via an online interface. What's odd is that you can't see the menu system on your display device, at least through the HDMI connection I used. This complicates the setup process if you'd prefer to handle things directly via the device, and it also means that you can't see volume going up and down, inputs changing, etc., during everyday use. To set up the online interface, you can get the Foundation's IP address via the menus on the front LED window or you can assign a specific IP to the unit as you see fit. Once you're connected, you can perform all the necessary setup tasks, like configuring inputs. It can be a little clunky to get your inputs assigned correctly, as you've got upwards of 16 total inputs. One nice part about buying a Foundation from a top Krell dealer is that the setup task becomes the dealer's problem, and any learning curve for the Krell online interface is also the dealer's concern. If you want to be more hands-on or DIY, you will need to take a little time to learn your way around. This is no different than, say, Meridian's setup software or that of other top receivers and AV preamps. The Krell Foundation, in its early life, has already had a number of firmware updates that have improved functionality and reliability of this $6,500 AV preamp quite nicely. Much like setting up a new Mac or PC, you will need to check to see that you've got the latest updates. The Foundation lacks wireless connectivity, but there is a highly important hard-wired Ethernet connection that you will need for such updates. Doing the update via the network option is pretty simple; you can also update the Foundation via USB, which requires a standard micro-USB connector that is not included with the Foundation. A network connection is really the best way to keep you up to date. Krell ARES room correction is built into the unit, and the Foundation comes with a measurement microphone, like most AV preamps of its type. Setup options include automatic speaker setup and room EQ. You can run the speaker setup and not the EQ if you like, and advanced users have the option to manually adjust the crossover and delays in the Edit section. The auto-EQ can be full-range or targeted at lower frequencies, which is an increasingly popular way to go these days for people who just want to fine-tune the setup of their LFE. You can create multiple presets for full-range EQ and lower-frequency EQ, and then toggle back and forth from the memory options to see which one you like best. When I used the opening scenes of The Dark Knight on Blu-ray to test the different auto-EQ options, it became pretty evident to me that I preferred to keep the EQ turned off. The auto-EQ seemingly limits some of the ambient detail that you can clearly hear without the EQ. The sound was more open and spacious, and the musical soundtracks were more lush and three-dimensional with the EQ off. Don't make this a major ding on the Krell; many auto-EQ products are well-intentioned, but in reality, the unit just sounds better on its own. Read about the performance of the Krell Foundation AV preamp on Page 2.